Steve Ballmer, former Microsoft CEO, and his wife Connie Ballmer, co-founder of Ballmer Group and civic activist, visited Dayton recently to hear from Tom Lasley, CEO of Learn to Earn Dayton (L2ED), state legislators and local community and educational leaders about the successes and hurdles of the region’s cradle to career efforts. Understanding how these efforts are fostering positive trends in kindergarten readiness, high school graduation, and college enrollment and graduation rates is an important aspect of Ballmer Group’s work and their grant to StriveTogether, a national nonprofit network of nearly 70 community partnerships including L2ED. In recent years, L2ED has received significant recognition and funding from local and national organizations for its work. The Lumina Foundation, which designated Dayton as one of the 17 national “talent hubs,” awarded $350,000 in 2017, and the Chan Zuckerberg Initiative, founded by Facebook co-founder Mark Zuckerberg and his wife, Priscilla Chan, recently provided a $150,000 planning grant. Additionally, Cincinnati’s StriveTogether has committed $500,000 for 2018-19 with a potential additional $1 million over the next two years as part of its Cradle to Career Community Challenge aimed at improving outcomes and reducing racial and socioeconomic disparities in communities across the nation. 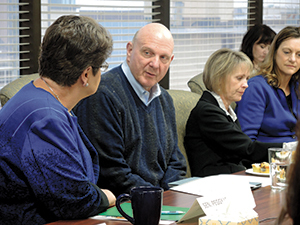 Ballmer Group, which is investing $60 million over six years toward the plan, hopes to accelerate collaborative cradle to career efforts. L2ED was one of only 16 community projects in the nation awarded this funding, which L2ED is using to place equity fellows in Montgomery County school districts, including Dayton Public Schools. Strides already are being made in the county. Based on the American Community Survey, Montgomery County has increased its overall intellectual capital at twice the state and national average, a fact that L2ED leadership proudly shared with the Ballmers.